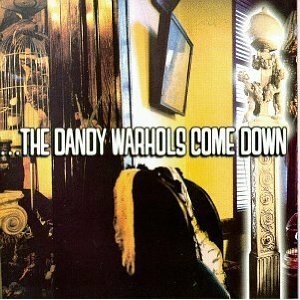 Fulfilling at last, for all concerned, the promise they have always shown, the Dandy Warhols come clamoring down upon the national scene with an album so full of clever hooks, lines and riffs that they qualify as an endangered species act. Warhols mastermind Courtney Taylor has colluded with Tony Lash to produce a sonic labyrinth, the majesty of which seems to capture everything right about Pop music for the past thirty years. At every turn a new musical confluence appears, bubbling up among the primordial walls of thick guitars and sharp, angular rhythms. Perhaps the most noticeable addition to the Dandy sound with which we became enamored on Dandys Rule OK is Zia McCabe’s more audible presence on synthesizer, which adds a decided turn-of-the-millenium feel to the retrofit psychedelia dished out by Taylor on rhythm guitar and Peter Holstrom on lead. Secondarily, the guitarists have layered dense slabs of multiple guitars onto most cuts, creating a roiling cauldron under which drummer Eric Hedford builds a consistent rhythmic fire. While the band cites The Velvet Underground and T. Rex, influences abound— from The Beatles, The Troggs and The Beachboys to the 5 Americans and Creedence Clearwater. The Dandys are to American Pop what Oasis is to English Pop: a pure synthesis of every catch hook that ever went before. The twelve songs and two instrumental pastiches presented seem grouped into suites of two or three pieces. But each tune is given its own distinct arrangement and production, which shrewdly disguises the fact that most of the of the songs are based on progressions consisting of (rarely more than) three or four chords. We begin the journey in the antediluvian morass of the intro to “Be-In.” Machine-like guitars whir and churn as broad keyboard pads and random samples filter through the haze. Slowly Courtney appears with a three-chord phrase that is soon pushed forward into the verses by Hedford’s Bonhamesque kickwork and Holstom’s heavily effected lead guitar, resolving in a slashing chorus. Like Syd Barrett-period Pink Floyd doing the Beatles’ “Tomorrow Never Knows.” McCabes simple, yet effective keyboard flourishes in the fadeout are tantalizing examples of her more subtle prominence in the sonic fabric. Zia’s twirling synth tone is the thread that attaches “Boys Better,” as Courtney jumps in with a snarling E-G-D-A-E, “Gloria”-like, progression, overwhich buoyant vocals lead to a darker variation on the turnarounds. “Minnesoter” could easily the handclappin’ followup to Stan Lynch’s “Mexican Radio,” smartassed vocal and all, laid out over a loping Lou Reed groove and Holstrom’s smart lead riff. “Orange” and “I Love You” are slow drowsy numbers. In fact the drum track on “Orange” sounds as if it were slowed down from its original speed. Over that Taylor and Holstrom layer languid guitars as Courtney sleeps through the vocal. Peter’s faint, agitated guitar circles like a mosquito buzzing upon the periphery. Two alternating chords shared between guitar and organ propel “I Love You” into a spirited Beach Boys inspired chant, that could easily pass as an outtake from Smile. Dense strata of psychedelia bubble up as freaked out guitar and synth sounds vie for focus in the kaleidoscopic collision of aural planes. By now, most astute consumers of Alt radio have probably tuned into the delicious concoction that is the Dandy’s first single “Not If You Were The Last Junkie On Earth,” with its cool, untrendy chorus “I never thought you’d be a junkie because heroin is so passe.” But beyond the catch phrase is a droll lyric and a listener friendly feel that worked so well for the Beatles and Creedence Clearwater Revival with in the context of their own individual idioms. An amazingly hip entre upon the hip national scene. McCabe and Holstom again combine on “Every Day Should Be A Holiday” to navigate an ’80s techno groove that resolves into a Duran Duran-like verse and a memorable chorus. “Good Morning” is the successful follow-up to Dandys Rules’ “Lou Reed,” a sweet four-chord beauty upon which Courtney intones a low Louish prayer to the splendor of simplicity. “Whipping Tree” unfolds like a hot dusty day in a Pink Floyd world, drifting gently upon a simple guitar phrase. “Green” maintains the dreamy atmosphere, with sunny guitars and birdlike keyboard lines cascading across the drowsy lyrical horizon. “Cool As Kim Deal” starts off with Hedford echoing Ringo’s brief intro to the reprise of “Sergeant Pepper.” But the band quickly jumps off into a hopped-up “Wild Thing/Louie Louie” motif, nicely appointed by Zia’s simple but effective Farfisa filigrees. Syncopated handclaps and smooth vocal harmonies dress up the modest chorus. Chaos reigns on the intro to the hard charging “Hard On For Jesus,” as Holstrom sets his guitar phaser to stun, while Zia makes the most of the mono mode on her synth. A Holstrom’s guitar shrieks throughout, in a high-pitched drone, as buried vocals seem to be singing good-naturedly about the search for spiritual fulfillment. “Pete International Airport” is a bird of a different color. A mystically dark tone poem, vaporous guitars circle between a major/minor interplay, while sustained synth pedals hum underneath. Slowly, harrowing mechanical shadows and clouds gather to consume the mantra, turning endlessly until the piece’s completion. Another instrumental, “The Creep Out” combines a funky swamp feel with synthesized jew’s harp/digereedoo drones, before Hedford’s muscular, Bonhamesque drums set the train in motion, rockin’ down the tracks: destination unknown. Capitol Records seems to be onto something; a small stable of hit acts with Portland in common among them. Perhaps its only coincidence that Everclear, The Dandy Warhols and Meredith Brooks (though admittedly, she has been away from the Portland scene for over 10 years) all hale from Portland. But it’s no coincidence that all three bands write great hook-laden Pop music. That’s why Capitol is one of the major players in the industry. They recognize these things. And perhaps it’s no coincidence, seeing as how Portland has always been a representative proving ground and test market. If you can make it to the top of the Portland pig pile, you can hack it on the National circuit in any city in the country. And with The Dandy Warhols, Capitol has hit the jackpot. For the band hits the stylistic middleground between Everclear’s grungy bad attitude and Brooks’ zen bitchiness, with a fresh, bouyant sound that strikes a chord of hope and optimism that the others do not. There’s not a missed step on The Dandy Warhols Come Down. Every song coils around thick roots, going deep to the heart of a long Rock tradition. to the coreThe vocals, while often somewhat faceless, still manage to lure the listener into the Dandys’ happy world, where people actually have consciences and act upon them. The ensemble instrumentation unfailingly delivers exciting new variations on standard Pop themes, which is astounding, given their rudimentary construction. We’re going to be hearing from The Dandy Warhols for sometime to come. Courtney Taylor and company have a knack for the hit song and for laying it out in a distinctively jaunty way. Whatever else transpires in the realm of Rock music that will always be the axiom upon which the industry turns. 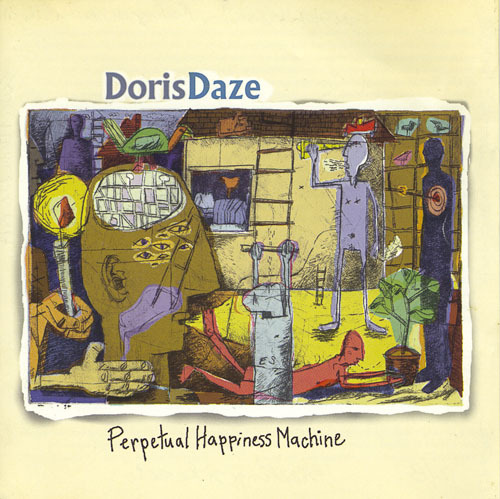 Doris Daze who made an impact in 1994 with their first recording Foom and scored again with last year’s Uncle, show no sign of letting up with Perpetual Happiness Machine. Singer/guitarist Maria Callahan, who is also the band’s chief songwriter, displays a durable appitude for creating memorable, if quirky songs and the ability to color them with unusual guitar formulations.unusual guitar formulations; singing them with a rich, evocative voice. Maria phrases the lyrics of “Little Things” with a Chrissie Hinde touch in the verses and Suzzane Vega in the chorus.nde touch in the verses and Suzn Neil Youngish guitars wrangle against passing Soul upstrokes.chunky Tight harmonies help to lock in the simple chorus. The riff to “Apple Pie” owes a debt to Lynyrd Skynyrd’s “Sweet Home Alabama,” but takes a different direction, with an infectious chorus, and inventive drumwork by Scott Crabtree. Crabtree, who shares background vocal duties with Maria, and on occasion with rhythm guitarist/multi-instrumentalist Erin Moreland, consistently adds solid, tasteful parts– vocally and instumentally. A windy, Country/Folk feel blows through “Hercules,” while cameleon-voiced Maria calls to mind Joan Baez plaintively calling over the jangling acoustic guitars. Pretty harmonies in the turnarounds and Maria’s whining, whisling solo help to make this tune memorable.tover bassist Erik Merrill’s churning lines The driving waltz of “Watching You Watching Me” invokes the Beatles’ “Norwegian Wood,” performed by Vega and Aimee Mann. Moreland’s riverboating banjo and guest Jackie Sauriol’s Dylanesque harmonica solo add a taste of Americana posibly to the stew. the tastemusical The Beatles come to mind again with the Bach flavored chord progression and gorgeous close harmony. Maria and Erin, whose voice somewhat resembles that of Victoria Villiams. Another churning waltz, “Eyes Tomorrow” favors more the work of Chrissie Hynde. Maria’s quizzical lyric twists inside Merrill’s skipping bassline: “Catherine waits/She waits too wonderful/Hatching snowfall/From the seeds above her head.” Maria cuts loose with a searing slide solo melts into a delicious which interplay between she and Erin. Very nice. The curious “Smashing Room” contemplates the mysteries of human compulsiveness and compulsion. “Hey mister bonfireman are you running out of would be much simpler than simply misunderstood.” Oh yeah! Erin’s exquisitely delicate ballad “Sad Sad Sad” threads upon her pretty, arpeggiated guitar embroideries and sorrowfully meloncholy vocal delivery. Sue Bernstein’s mournful cello and a lattice of angelic harmonies from Scott and Maria make of this a sparkling gem. “Snake” rebounds, riding on Crabtree’s smart drumwork and Maria’s jagged guitar.mwork and Maria’s jagged guitar, calling to mind Kristen Hersh’s earlier work with Throwing Muses. 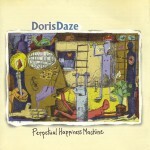 Consistency is the watchword with Doris Daze on Perpetual Happiness Machine. Their unerring good taste and clever versatility make of every song a sonic poem or short story. Each member adds specific gravity to the whole of the bandÑ thus bequeathing them with the luxuries of subtlety and variety, without dilluting their power. Every song here is a polished gem. Former leader of Litlle Women, singer/songwriter Jerry Joseph is back with a new band and a slightly different musical direction; adapting elements of Soul and Funk into his repertoire of styles. Longtime fans of Jerry or of Little Women might find this stylistic departure a bit disconcerting. but underneath it all, this is still the work of a hardscrabble working man, cut out of the same mold as John Mellencamp, John Hiatt and Graham Parker. 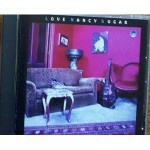 John Mellencamp, John Hiatt or This five song EP serves as a nice introduction to the band. “Big Things” follows bassist Junior’s sprinting lead over Adam Sorenson’s spare drumming. Jerry adds an array of sparse acoustic guitars and a bent string electric guitar figure, as he sings a lyrically elusive tale sketching the impermanence of all things in life. Keyboardist Dave Pellicciaro enters midway with digital strings, skewing somewhat the scope of the song. Pellicciaro’s spot-on jazz organ colorations are the entire impetus for “Staple Gun;” nterjecting percussive chord fills and smoky sonorous lead themes against Jerry’s bleakly oblique narrativeabout masochism and self-abuse.i Still, it’s probably the most successful outing of the bunch. “Dixie Mattress,” comines Jerry’s funky guitar scratchin’ with Pelliccciaro’s chunky Rhodes foundation, hammering out a tune that sounds not unlike Southside Johnny Lyon fronting Little Feat. Curious. “The Jump” combines Pellicciaro’s majestic organ and piano articulations with Jerry’s burbling electric guitar flutings, creating a lush jungle of sound wherein the agitated claustrophobia of the lyrical story unfoldsÑ not unlike that of Mr. Kurtz in Conrad’s Heart Of Darkness. Think of Peter Wolff of J. Geils Band doing a Bob Segar tune and you’re probably close to realizing “These Gray Days,” probably the closest thing to a Little Women song on this outing. 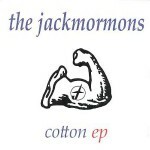 Understandably, with a new lineup, things are a tad uneven with the Jackmormons on Cotton. It’s obvious that Jerry Joseph is not content to rest on his laurels, but is seeking to move in different directions. This is difficult because Jerry, while having an evocative and authorative vocal instrument, is not blessed with much of a range. The arrangements here sometimes collide with Joseph’s purposes as with the misplaced strings on “Big Things.” But at other times, as on “Staple Gun” and “The Jump,” the band constructs quite a nice vehicle in which Jerry might ride to different territory. 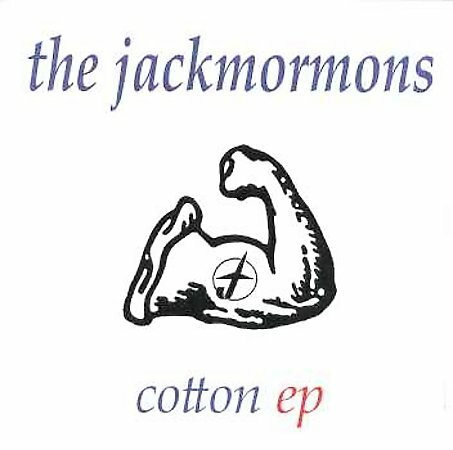 It will be interesting to see where the Jackmormons go with this sound. For it is obvious that they have yet to reach their final musical destination. This is but an early stop along the way. “Strange Secrets benefits from this “process. C. Eric Lien’s restrained guitar melds smoothly with Gregory “PJ” Smith’s bubbling Rhodes sound. The chorus, which does not appear near often enough in the song, is a lush whirlpool of Gina’s ephemeral vocals and the band’s elegantly understated performance. Another favorite, “Every Single Time” is more restrained, though still motivated by a driving guitar figure. Smith’s translucent keyboard insinuations add a nice new touch to the sound. “Stay” is more straight-ahead than in its previous incarnation. Smith’s subdued organ phrasings underscore the crystaline aspects of Lien’s guitar arpeggios.shimmering Ñ Gina’s voice is more prominent in the mix, less reminiscent of other vocalists. The new material displays several exciting examples of a nascent sound emerging for the band. “He’s The One” rocks smartly on Lien’s roiling wah guitar and Smith’s sure-handed organ pads over Don Lawry’s insistent drums. Gina’s voice seems more energized here than on other cuts, pushing the tune slightly. “Look Behind Myself” explores Eastern-tinged orchestral realms in the breakdown. Gina intones clever lyrics with constrained gusto. “No Amends” and “Jumping Off” each display pleasing characteristics but fall short of being entirely memorable, perhaps too dependent on the unfolding of the lyric to find spontaneous shapes of their own.o Amends”sssmusical But “Give Me” creates a certain tension over Lien’s blustery guitar. With Gina’s distinctive vocal melody and astute keyboard support from Smith, a luxurious environment is created. And “Jumping Off” works as a forthright piece of Pop. But “ParkaA good song. The grandest stylistic departure is with the snakey rhythms and dest stylistic departure is “Give Me.” TLatin moody sensuously moody instrumentation work especially well with Gina’s clear voice ringing through the smoky atmosphere Snake. Only the lack of a strong chorus prevents this from being a hit in the Debbie Harry tradition. But the lack of these simple devices weighs down many otherwise solid songs. As songwriters, LSN owe it to their songs to from develop them to their fullest. The instrumentation here is always imaginative and well thought out. And Gina’s range of vocal expression is wide and expressive. As It is only the lack of consistency that prevents Love Nancy Sugar’s music from being as dynamic and winning as it might be. 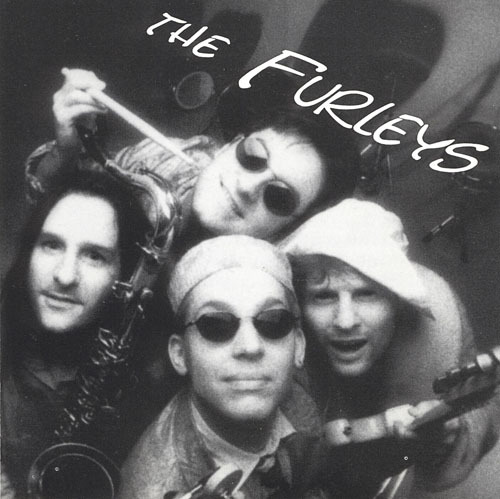 The Furleys lineage extends back to FunkKnot and Funk ‘N’ Judy, maintaining a high proficiency in the art of gettin’ down.ency in the art of gettin’ down for nearly five years in our hallowed musical community. At this stage they have honed their chops to a fine edge, following a tradition that like Reggae and the Blues transcends all musical barriers of taste and trend. The eight songs presented here are each well-crafted examples in that tradition. “Whatever It Is” glides on vocalist Brian Copeland’s slippery guitar rifage, as Rob Schrecongost provides the roving bottom on bass. Drummer Robin Way kicks in, with Mark Talley tracking a downtown sax part across the surface. Over this tenacious groove Copeland vocalizes a knowing inventory of the plights of Man— offering no solutions, other than “that’s what it’s all about,” Well, there it is! The Furleys kneel at the altar of George Clinton with “Mama Ship,” a good-humored take on the possibilities surrounding the seduction of an alien. “I need worldwide help/for my space age connection/I need worldwide help to give me satisfactio/So take me to your mama ship/ I wanna get higher. Talley’s sax fills, full of slick glissades and ragged overblown notes, sets the mood for “Journeyman,” “I keep groovin’ on.” A sly reference between guitar and sax to War’s “Lowrider” sneaks in at the fade out. Cool. Copeland stretches out with a hot “Shaft”-like lick on “By The Hand.” Strong harmonies help to nail down the chorus. While the Furleys are far from original, predictably derivative to a fault, they are irresistably danceable all the same. They offer, a diverse selection of Funk grooves and rhythms, laid out with reverence and poise. While they might be best experienced live, this recording does nothing to diminish their obvious propensity for fun.